The most cost competitive style with a sleek outline. 13mm EVA sole with vinyl straps. New Youth Sizes Now Available! Disclaimer: We must be notified of any product concerns within 2 weeks of receiving the order. Concerns brought to our attention beyond 2 weeks will not be addressed. Imprinted: $50.00(g). Imprinted price includes 1 stock color on insole. Heel decoration: 1 color maximum. Imprint dimensions: 2″ x 2″. Neet Feet Hang Tag included. Custom Hang Tag: $0.50(c) each and includes 1 color imprint up to 3″ x 3″. Nylon Mesh Bag Packaging: Minimum 48 pcs. Starting at $3.40(c) each for 8″ x 14″ or $5.50(c) each for 15″ x 18″. Pricing includes bag and packaging flip flops in bag. Set Up Charge: Imprinted: $50.00(g). Imprinted price includes 1 stock color imprint on center panel. Additional run charges apply for second color: $0.36(g). Imprinted: $65.00(g). Imprinted price includes 1 stock color on insole. Custom Hang Tag: $0.65(c) each and includes 1 color imprint up to 3″ x 3″. Nylon Mesh Bag Packaging: Minimum 48 pcs. Starting at $6.82(c) each for 8″ x 14″ or $8.34(c) each for 15″ x 18″. Strap and sole must have same color. 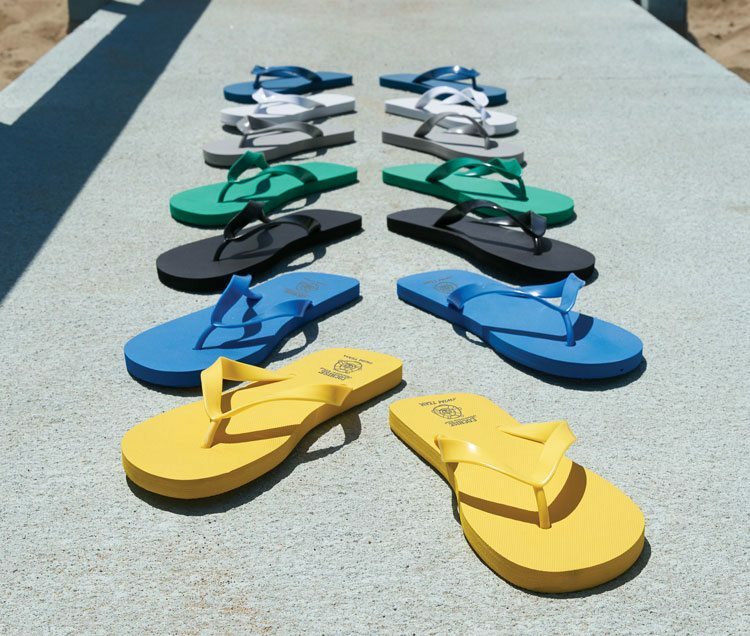 Cannot mix and match different strap and sole colors. **Youth sizes available in gray, black or navy only. Sizes can be mixed - minimum 10 pairs per size. We now have new hang tags that are included with your flip flops. 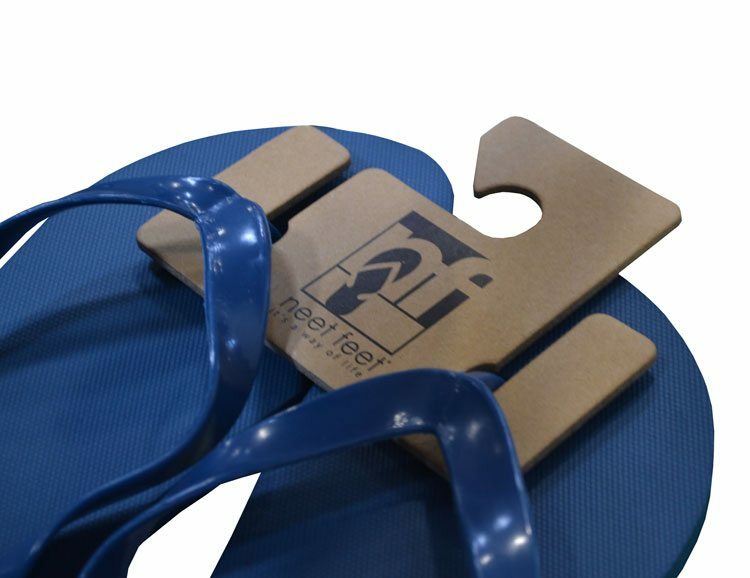 They come with the Neet Feet logo on them so they are easy to hang on any display and keep each flip flop together as a pair. Or Create Your Own Custom Hang Tag! You can now order your own custom hang tag with your logo on it for $0.50(c) US ($0.65(c) CAN) each for a 1 color imprint that can be up to 3in x 3in. Call today for examples or to let us create a virtual mockup for you! Upgrade this footwear with a Mesh Bag! 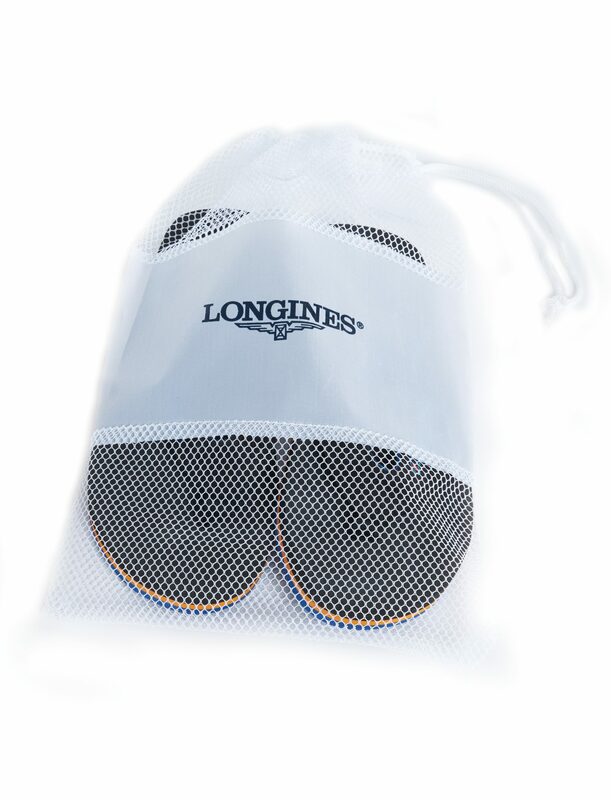 Upgrade your flip flop or brand presentation with a cool, black or white drawstring nylon mesh bag. We can imprint the center panel with your art or you may order without printing. Now Available in two sizes: 8″ x 14″ or 15″ x 18″. ©2019 Neet Feet Custom Sandals.